To Treat TMJ disorder successfully, one must first understand the reason for the injury to the joint and why the body is not able to cope with this injury. This sounds simple but to truly do this one must look at the structure of the entire body and take into account biological, chemical, and psychosocial factors. 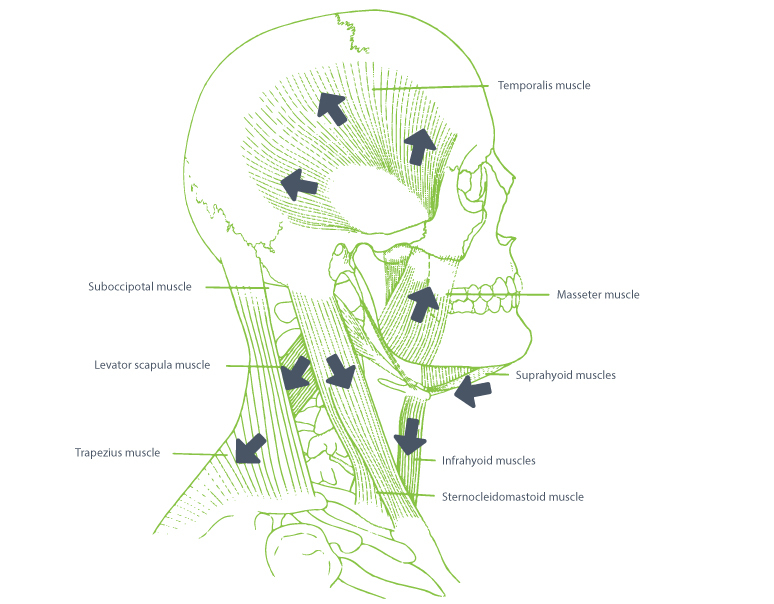 The diagram below shows the complex relationship of the muscles around the jaw joint, cranium, neck and shoulders required to remain in balance to achieve a comfortable jaw resting position and a good joint position. pounded by other factors such as clenching, grinding, disrupted sleep, nutritional deficiencies, sustained activity that involved poor posture (e.g. looking down for sustained periods or playing musical instruments), bad bite, and stress – the injury can become worse. Once the injury is beyond the body’s adaptive range, it plays out as pain. So what can cause an imbalance in the muscles/structure, which result in maintaining a painful resting position? The answer is complex, but it can involve Cranial dysfunction, Cervical (neck) dysfunction/injury, a bad bite which causes sustained jaw movements that are not smooth, sacroiliac (hip) dysfunction, foot dysfunction and disc displacement within the joint. This can be further complicated by ligament laxity, damage to tendons and underlying fascia, as well as injury to ligaments around the teeth and nerves that supply the head and neck. The way the teeth meet, the position of the lower jaw within the joint, head position, hyoid bone position and neck posture are all like a series of cogs that affect the TMJ. Some sites are stronger than others, such as the neck bones and teeth; however, the joint in itself is weak and susceptible to damage from the stronger cogs such as a bad bite and neck dysfunction. Furthermore, because the left jaw joint is connected the right, often disruption of one side will cause pain and symptoms on the opposite side as well. 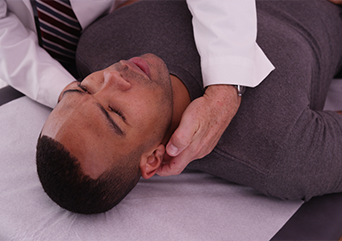 In summary, when it comes to successful TMJ disorder treatment one must look at the joint itself, the bite, the neck, cranium, hips, feet, and the body as a whole. One must not only look at what caused the injury, but also the complex factors that stop the injury from healing. What is causing sustained injury and what is deficient in the body that is not allowing the body to deal with the injury? 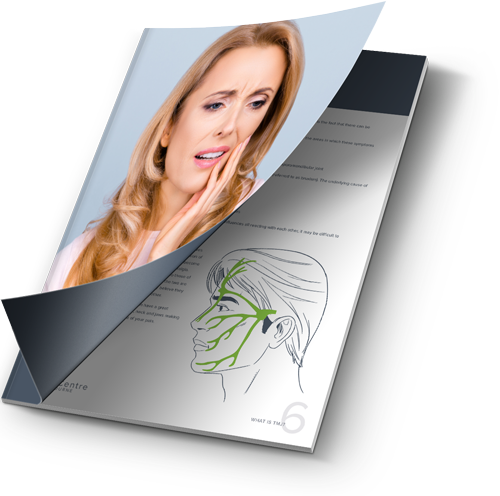 In order to receive an effective diagnosis and treatment plan, it is important that you visit a qualified practitioner in the field of TMJ dysfunction. Dr Meetal Shah and Dr Eric Dowker at TMJ Centre Melbourne have over 50 years’ combined experience in the treatment of TMJ dysfunction. What makes TMJ Centre Melbourne truly unique is that you will receive treatment from a TMJ dentist and TMJ chiropractor at the same time, ensuring both diagnosis and treatment are tailored to each patient’s unique condition. By providing a holistic approach to treatment, pain isn’t simply minimised, it is treated effectively and appropriately for long-term results. To book a consultation, contact the team at TMJ Centre Melbourne today!